It has been more than a year since I have posted anything here and I think time has come to retire this blog. I am moving to a Jekyll based blog hosted on my website here. WordPress is a great platform for blogging – but there are times when you want to tinker with the template or put up code segment and code formatting was a pain. Markdown is easy, I can write from my text editor and also when I am offline. 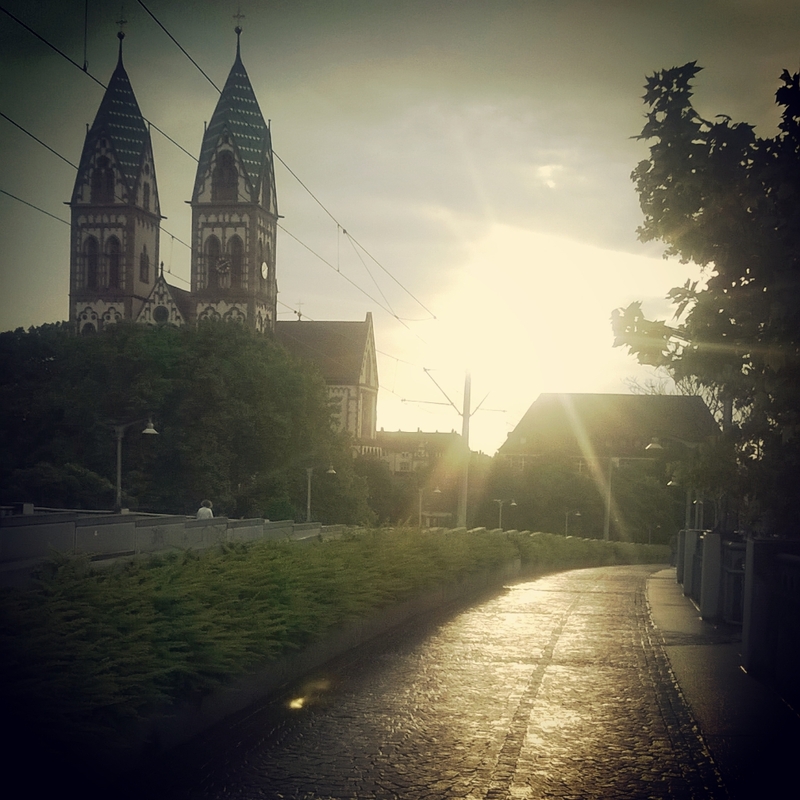 Freiburg (Germany): It is small town extreme south of Germany. It was where I stayed during the three months. It is a nice and warm student town and you get really awesome beer at the Feierling Beer Garden. They were new. They were the change. But they heard another change was coming. A new dictator – a symbol of hope supposedly. He came, but he didn’t like change. He was stone, indifferent to the outside world. He was a conventional slave, who was scared from trying out the new. It was massacre, one by one he played his moves. These people opposed to the injustice, the oppression in the most gentle way possible. He was ruthless, unwilling to listen to anything. He did not respect women, nor did he follow the standard protocols of running an empire. He left every other minister with no choice but either to follow him or die. Alas! These new people, their philosophy, all were at the verge of extinction, but he didn’t care. What had they done? They tried to make him understand their value with logical arguments. But given a dictator that he was, he didn’t allow them to speak and hardly met them. The decision was taken to banish them, to ensure that no further new people is ever born in the state. These people being constitutional beings, looked forward for redress. They had only hope on their side, a hope for a brighter future, a hope for a better world for everyone. I had spent this Saturday participating in Node Knockout. I had planned for a little Travelogue web app called Mapvel, with which one can share his experience about the current location, hence other users can get what people think about a place. I was planning to make use of a person’s real location by using the HTML 5 Geolocation API. My team name was Struggler, that shouldn’t be a surprise considering that I am making this post. But then things went downhill from there. I got this idea around 10 hours into the competition. Then I realized that to store Geolocation and perform spatial queries, I would need to use MongoDB. But this was the first time I had even planned to use it. Then I thought, lets make people sign in with Twitter, oh well, this was the first time I was implementing OAuth stuff in Node.js. Hence most of my time was spent in reading the docs and playing around with these. The build part comes later. Apart from that there were some awesome happenings in college (I am being sarcastic!) and I also have 4 project submission to do this week. Excuses aside, I sat Saturday evening and night and got a basic version of the app running. Twitter login worked, MongoDB worked, I started hating Jade even more. Today morning I woke up and decided to give up. It was good experience, I was coding fast, and learning fast as well, I just implemented login with Twitter and was querying MongoDB in few hours. Maybe I’ll get back to completing this Mapvel some other time. Few days back I sat down and cooked up something, an esoteric language made only of Morse code characters: . and _. I won’t call it a full programming language per se, but then it can be used to make some fun stuff (without the codes making no sense by themselves). The docs are up on the website and source code is on GitHub. In the meantime here is a morse “Hello” program. Couple of weeks back I was at Mozilla Summit at Santa Clara, USA – a grand get together of people who contribute to people. This was the first time i was meeting the first global Mozilla community, the first time I went outside India. It was a massive effort to bring the paid employees as well as the voluntary contributors at the same place. I got to meet and talk to people with whom I had only been talking on IRC. Mitchell Baker’s keynote on the Nature of Mozilla, really set the mood for the Summit and it best defines why Mozilla exists and why we all gathered over the weekend to discuss the future goals and plans for Mozilla. It was very informative to see the demos and talks about the upcoming projects and products we are working on, advances with respect to performance of FirefoxOS, brainstorming on the different products and discussion about how we can improve the Mozilla ‘platform’ code, sessions about Servo, how to appreciate contributors and so many others. At Innovation Fair booths I could interact with all these people who are working on these projects, and it gave much better insight. It was a great event, I felt a part of the common cause, of a shared vision — of an open web. PS: Thank you Mozilla for the free passes to Great America, the amusement park was one experience I will never forget. This post is intended to the Systems Science students taking the Embedded Systems course at IIT Jodhpur. The Keil IDE is inefficient to do normal programming for the ARM platform, and setting up a virtual machine on an ARM processor is too hectic. But it turns out QEMU can run the binaries using the host OS itself, so its dead simple to set up an ARM system on your Linux. I will be using the Ubuntu distro for the same. Install the following packages from the Terminal. Write some assembly in your text editor. There are some differences from the syntax taught in class. to signify that it is the global start for your program. Also any label needs to be followed by a :. Here is a sample program that calculates the factorial of 10. Hence, we have a fully functional ARM build from our host Linux system itself. After listening to Steve Klabnik‘s talk in RubyConf India, I really wanted to try Ruby and Shoes as well. After messing with it for few hours, I came up with Socks. 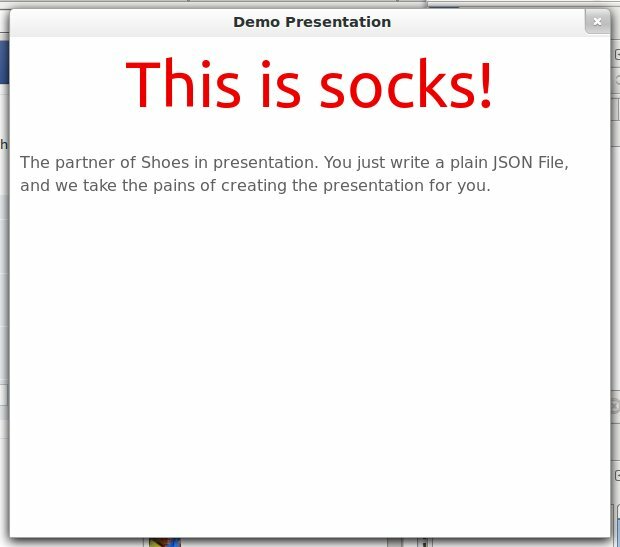 Socks is a Shoes app that takes in data in JSON format and renders them on screen. 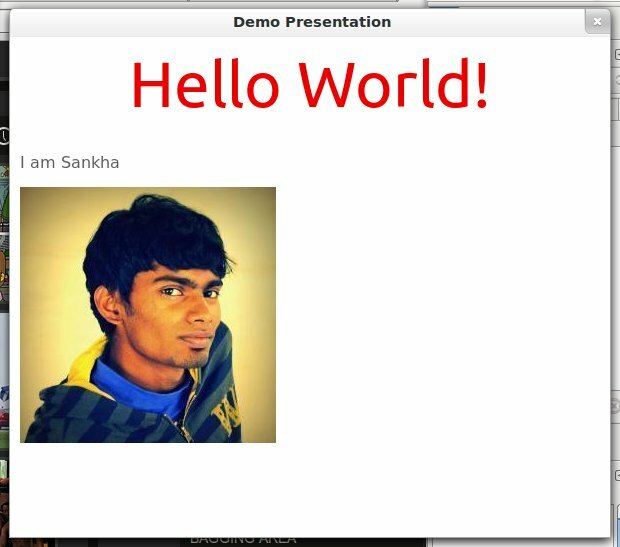 Its designed to be used as slides for presentations, so supports only text and images. You can put all this together and Socks will create a nice presentation for you. It renders just text and images now. Go give it a try, its on GitHub. Any help for Socks is appreciated, so just fork and send me a pull request! Warning: This post is a non-Rubyist’s take on RubyConf India. Forgive me for my inaccuracies. I’ll accept it right at the beginning, I don’t do Ruby (forget Rails), having dabbled with it previously I knew just bits of it. And when I got the opportunity scholarship, there was no reason not to go. Reason #1: Ruby is nice, and so is the the Ruby community. Trust me, the Ruby community is one of the best that I’ve ever seen in my life. People are so friendly, progressive, open to discussions and ideas. Really amazing! Reason #2: The star cast at RubyConf India is pretty good. Let me list it out – we had Steve Klabnik, Jim Weirich, Aaron Patterson, Andy Lindeman, Nick Stutter, etc. Nothing is better that hearing the best from the pros. Reason #3: So many stories at one place. Yes, you get to hear the stories of so many people – each being an inspiration in itself. The times when Aaron Patterson says he is a college dropout thrice, denied the opportunity to study at University of Washington but then goes and teaches there for years, you feel no matter how bad the situation is, you can always get better. Reason #4: Ruby is for everyone – BRails. This really drew my attention – how much do we think about the physically challenged when developing products? Siddhant’s though visually impaired served as an eye-opener for everyone. He had be developing with Ruby and Rails for quite a few years – and developing teaching materials for the others. Reason #5: You can do cool stuff with Ruby and rediscover old school concepts again. Places where representation of the data matter more than just numbers. Parallelism can be both your friend and enemy (just like MRI and JRuby can be), how you can dive into Unix system calls from Ruby itself. Last but not the least a bit of Rock and Roll with Ruby doesn’t hurt either. For those who are wondering, what I am blabbering you should take a look at the list of talks. Bonus Reason: The beer parties after conferences are always awesome. Personal Takeaway: Do more Ruby and use it for more of my personal projects. There is a lot that can be done with it. 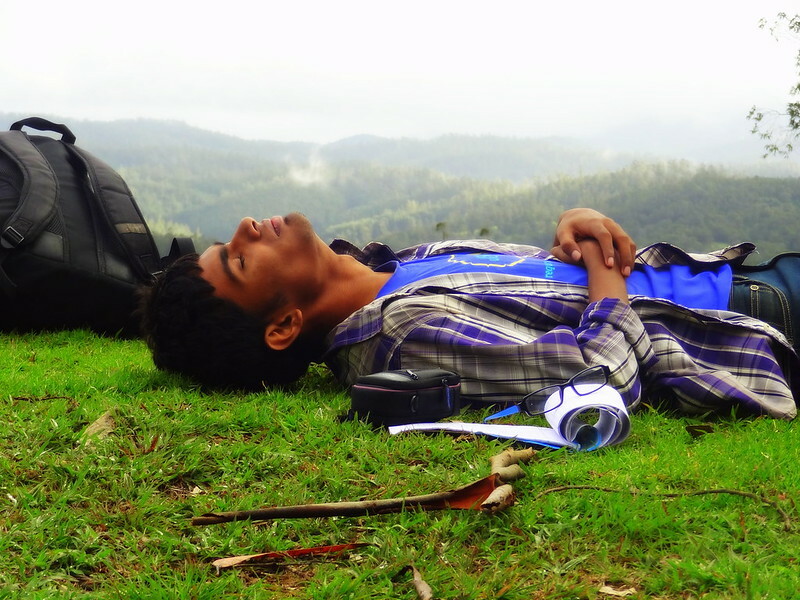 This weekend was at Ooty, also known as the blue mountains or Nilgiris. When I came to Bangalore little did I know that I would be going to Ooty 7000-8000 feet above the sea level. Well, I did not have any warm clothes, no sweaters/jackets. What followed was two days of shivering cold, but full of enjoyment. We traveled a lot, the lush green valleys and mountains were a welcome break from the hectic life in Bangalore. I had different kinds of tea – Masala, Chocolate, Plain (an achievement in itself). The tea gardens of Ooty had some magic of its own. To end the story, our last night at Ooty was too good. We ran out of cash (barring the 100 bucks I had saved up for emergency) and entire Ooty also ran out of cash. You got it right, all the ATMs in that place were out of cash too. Turned out we didn’t even have enough to have dinner. After searching our bags we collected Rs. 7, in all one rupee short of Rs. 108 – the bare minimum required for 3 people’s dinner. Whoever designed that Airtel ad, you did a very bad job. That 1 rupee was gold for us at that time. Nevertheless, the guy turned out be nice, served us food! We returned that night from Ooty. It had left a soothing impression on all of us. I now miss nature in that form. I have uploaded selected few photographs at Flickr. Check them out if you want to.